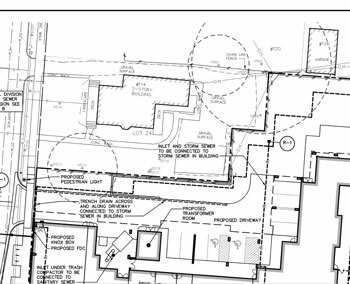 From the site plan application for 413 E. Huron. Critical root zones of landmark trees are shown by the dashed circles. The root zones were a focus of much of the questioning by councilmembers on March 18, and had been a focus of public commentary on April 15. The vote came on May 13, 2013 at a meeting that had started on May 6. On that night councilmembers had recessed the meeting around 11:30 p.m., just as the council reached the 413 E. Huron item on its agenda. The development was presented to the council as a “by right” project, which means that in the judgment of the city planning staff, it met all the zoning requirements. The site is zoned D1 (core downtown). 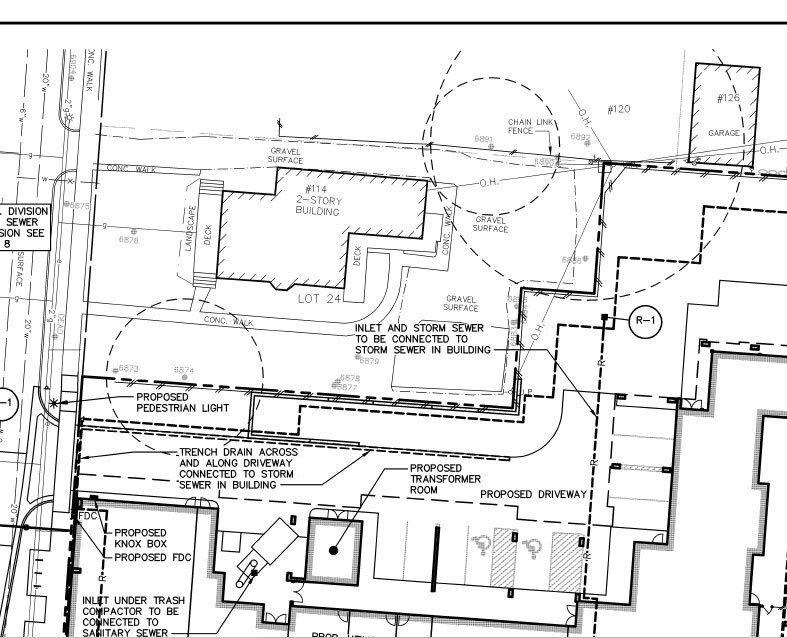 The council had previously postponed a site plan decision on April 15, 2013, April 1, 2013 and on March 18, 2013. Consideration of the site plan came after the council had considered and postponed – over the course of several earlier meetings – then finally voted not to impose a possible moratorium on site plan applications in the D1 area. Instead, the council voted on March 18 to give the planning commission direction to review the city’s D1 zoning. The scope of that review and a deadline of Oct. 1 was given at the council’s April 1 meeting. A new public hearing on the 413 E. Huron project was started at the April 1 meeting, and held open so that it could resume on April 15. That public hearing continued on May 6. The council’s split on the site plan vote, taken on May 13, was different from the 6-5 split on the moratorium question, which was considered on March 18. On that occasion, those who voted to leave some kind of moratorium in the resolution were Jane Lumm, Chuck Warpehoski, Mike Anglin, Sumi Kailasapathy and Sabra Briere. Voting to strike any mention of a moratorium on March 18 were John Hieftje, Sally Petersen, Christopher Taylor, Stephen Kunselman, Marcia Higgins and Margie Teall. Images for the proposed 413 E. Huron project, at the northeast corner of Huron and Division. On the left is an early rendering provided by the developer. On the right is an updated version presented to the city council on March 18, 2013.